Update: It's official, Windows 10 release set for 2015. Earlier today, Microsoft accidentally published their website detailing the impending Technical Preview of the next version of Windows, in the process revealing a new name for the OS. That name is 'Windows TH', as seen in the tabbed header alongside previous versions such as Windows 8.1 and Windows 7. It's entirely possible that this name is simply a placeholder for an official name that will be revealed in the future. However it is interesting that Microsoft didn't simply list the Technical Preview under 'Windows 9', a name that many people were expecting Microsoft would use for their next operating system release. 'TH' is likely short for 'Threshold', which is Microsoft's internal codename for the successor to Windows 8.1. The major update to Windows includes the return of the Start menu, numerous interface changes, virtual desktops, Cortana integration, and more. It's also expected to unify Microsoft's operating systems, combining Windows Phone, Windows RT, standard Windows and the Xbox OS into the one platform. 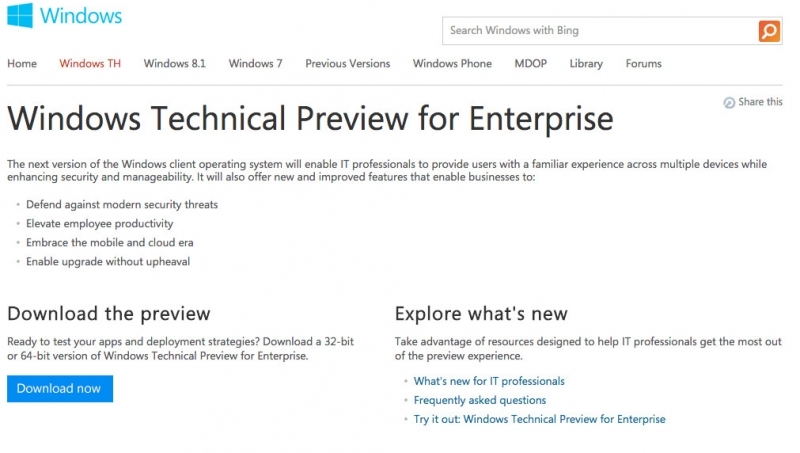 The page for the Windows Technical Preview for Enterprise, which has since been taken down, is being prepared ahead of Microsoft's event on Tuesday where the next version of Windows will be officially unveiled. It appears as though Microsoft will launch the Technical Preview shortly after the event, falling into an expected "October" launch timeframe.